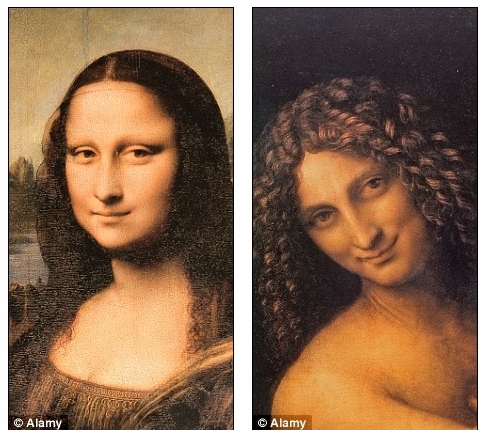 Mona Geezer: Was da Vinci's young male apprentice the model for that famous enigmatic smile? Art lovers have for centuries debated the reason for her enigmatic smile. Now it appears Mona Lisa may have been hiding a remarkable secret – she was a he. An art historian claims the model in Leonardo da Vinci’s masterpiece was one of his male muses, a young man called Gian Giacomo Caprotti, whose nose and mouth bear striking similarities to those of Mona Lisa. Caprotti, who was also known as Salai, worked as an apprentice with the artist for more than two decades from 1490 and they were rumored to have been lovers. 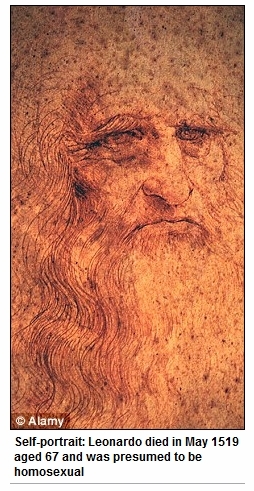 Some experts had already suggested Leonardo could have based his masterpiece on a self portrait. But Silvano Vinceti, a researcher who has been analyzing the painting using state-of-the-art high-magnification techniques, also claims to have found the letter ‘S’ in the model’s eyes, which may be a reference to Salai. Several of Leonardo’s works, including St John the Baptist and a drawing called Angel Incarnate, are said to have been based on Salai. Mr Vinceti, president of Italy’s National Committee for Cultural Heritage, said these paintings depict a slender, effeminate young man with long auburn curls and almost identical facial features to the Mona Lisa. Most experts believe the model for the Mona Lisa, which hangs at the Louvre in Paris, was Lisa Gherardini, the 24-year-old wife of a rich Florentine silk merchant. They say Leonardo started painting her in 1503. But Mr Vinceti claims he may have started in the late 1490s in Milan, coinciding with the time he built up a relationship with Salai. His claims have caused a stir in the art world, with many dismissing the idea that Mona Lisa was a man. 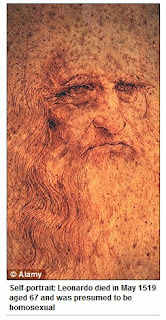 Da Vinci expert Pietro Marani said the theory was ‘groundless’. The art professor at Milan’s Politecnico university said: ‘All Leonardo subjects look like each other because he represents an abstract ideal of beauty. They all have this dual characteristic of masculine and feminine. ‘The work began as the portrait of Lisa Gherardini, but over the years it slowly turned into something else; an idealized portrait, not a specific one.